Adriana Haanen was the most important female flower painter of the 19th century and took the tradition of flower painting to a new level. In her work we notice a shift from the tradition of measured flower compositions applied in the 17th and 18th century to the more spontaneous, natural flower arrangements we see in the 19th century. This piece shows a simple arrangement of summer flowers in warm, rich colour. Stems of roses, peonies, morning glories, poppies and other blooms are arranged in a humble terra-cotta vase set upon a tabletop. 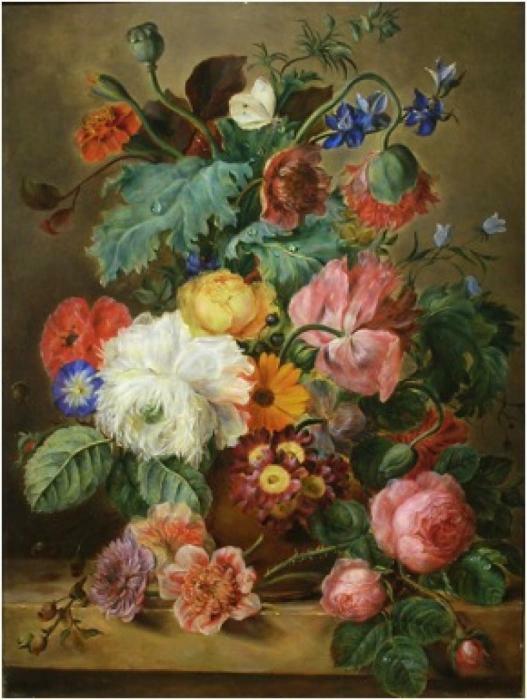 The flowers spring from the vase and wind about the table’s surface in a chaotic manner, giving the impression of a wild, lush summer garden rather than a carefully arranged display. Plump drops of water cling to the vigorous blooms, and a single moth is perched on a stem at the top of the composition. The warm red, orange, gold and pink tones of the flowers accentuate the summery feel of the work. The colourful blooms are set against a flat, brown surface that adds to the simplicity of the scene. The composition evokes the warmest months of the year and the fertile life of a rustic countryside. 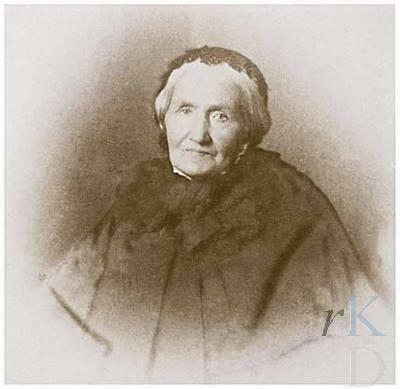 Adriana Johanna Haanen was born on June 14, 1814 in Oosterhout, in the southern part of Holland. She was the fourth of six children. Her father, Casparis Haanen (1778-1849) was an art dealer, restorer and painter of churches, interiors and landscapes. Just like her two older brothers and younger sister, Adriana received her first painting lessons from her father. From these modest begin . . .